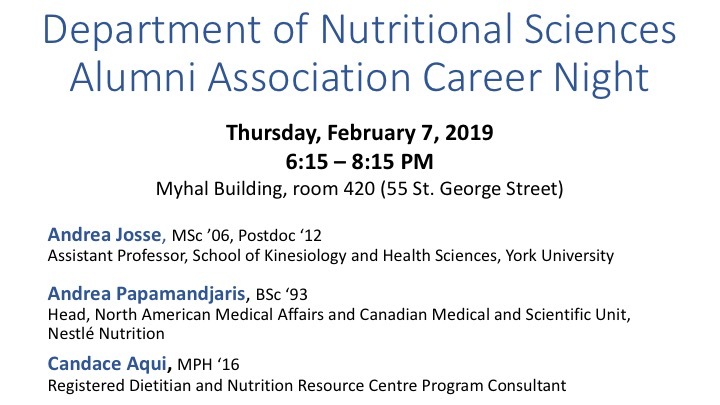 Nutritional Sciences alumni working in academia, the private sector and a government agency, will provide insights into the journey of how they got the great careers they have now. Anyone thinking about careers following their nutritional sciences degrees or would like to re-connect with fellow alumni are welcome. Join us at 6:15 pm for a career panel hosted by Nutritional Sciences Alumni Association President, Laura Pasut. Networking reception with light refreshments to follow.